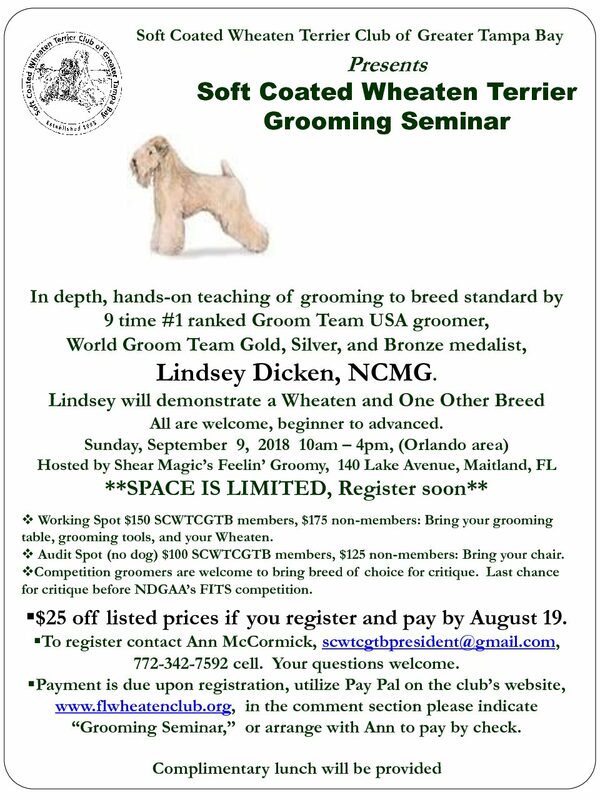 SCWTCGTB Proudly Announces a Special Seminar for Groomers, Handlers, and Owners Grooming for Show! Sunday, September 9, 2018 10 A.M. – 4 P.M. Maitland, FL (Orlando Area) RSVP by August 19th: Ann McCormick 1-772-342-7592 or scwtcgtbpresident@gmail.com The Soft Coated Wheaten Terrier Club of Greater Tampa Bay is sponsoring this special seminar for groomers, handlers, and owners grooming for show. A portion of the proceeds will benefit our 501c3 Wheaten Rescue. We hope you will share this with the person who grooms your Wheaten. The focus will be grooming to the Breed Standard. Members are welcome to attend. SCWTCGTB Wheaten Terrier Rescue lists Wheatens in need of rehoming and available for adoption on the Petfinder website. Search for them by clicking here. The Soft Coated Wheaten Terrier Club of Greater Tampa Bay is registered as a charitable organization in Florida (Reg No. CH50498).